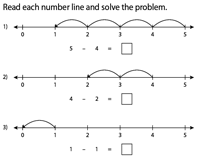 This gamut of number line worksheets is designed to strengthen the subtraction skills of young students. The topics covered on this webpage are solve subtraction problems, indicate hops on the numberline to find the difference; find the missing numbers; write, complete and solve subtraction sentences; number line MCQs and much more! Umpteen number of free printable worksheets are available for practice. 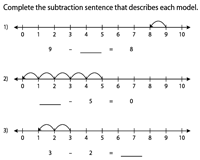 Read each number line and solve the subtraction problems. This series of number lines are classified into two levels based on the minuends and subtrahends. 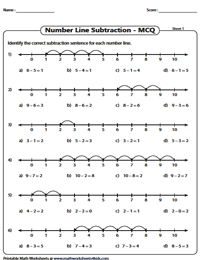 Indicate hops on each number line to complete the subtraction equation in this two-level assembly of worksheets. Look up the answer key to verify your responses. Read the number line and write down the missing numbers to complete the subtraction sentences. 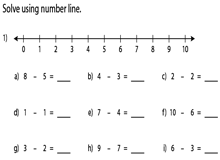 Strengthen your analytical skills with this collection of number line worksheets! 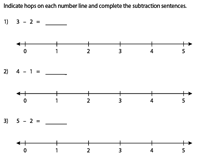 Observe the hops on the number line and then write down the correct subtraction sentence that best describes the number line. Use the 'Download the set' option to access all pdf files under this section. 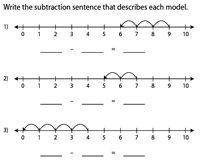 Use the number lines to solve the subtraction problems given in this array of worksheets. The problems are presented in both horizontal and columnar formats. 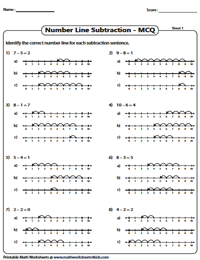 Observe each number line given in this group of MCQ worksheets and identify the subtraction sentences that best represents each of them. This set of worksheets contains a delightful twist to enhance your child's curiosity! Read each subtraction equation and spot the number line that makes a perfect match. 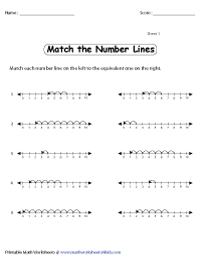 Match each number line on the left to the equivalent one on the right. Use these worksheets to help children hone their skills in subtraction.